Daniel Spence was born in Randolph County, North Carolina in 1806 to Elisha and Susanna Spencer Spence, and he died in Jasper County, Missouri in 1857. He was possibly named for the father of Lewis Jones–Daniel Jones–who had relocated to Tennessee before the Spences. 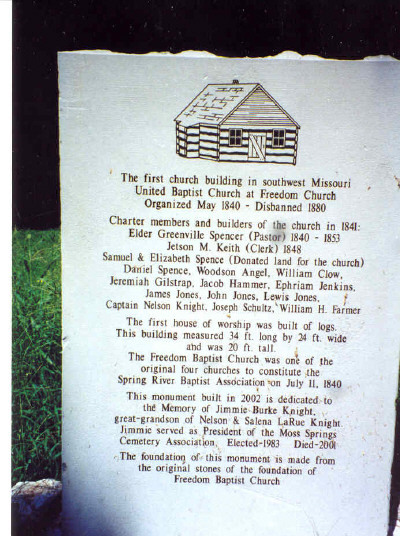 The earliest Jasper County, Missouri pioneers are buried in the Moss Springs Cemetery, many of them without tombstones. Such is the case for Samuel and Elizabeth Inman Spence, Lewis and Milly Catherine Spence Jones, and Daniel and Mary Ann “Polly” Pewitt Spence. Their names appear on the pioneer marker at the entrance of the cemetery, along with many others. Daniel was around four years of age when his family moved from North Carolina to Davidson County, Tennessee in early 1810. Unlike his older siblings who experienced moving from place to place–this was a completely new experience for young Daniel. He undoubtedly imagined all sorts of things as they traveled through the woods. After the family settled in Tennessee, young Daniel became adjusted to his new environment. To date I haven’t found the exact location where the Elisha Spence family settled in Davidson County, Tennessee. Williamson County was carved from Davidson in 1799, and I believe the Elisha Spence family lived on the border between the two counties. Elisha and his family spent as much time in Williamson as they did in Davidson. Associated families all resided in the Davidson and Williamson County area. The move to Tennessee was not without sorrow and precipitated an event that occurred late summer or early fall in 1810. Elisha and Susannah had a child every year or every other year. When they moved to Tennessee, Susannah had a set of twins born March 28, 1809, and she was pregnant again when they started their journey. The Spences had buried another child born in 1807 or 1808 in North Carolina. That child will be discussed Elisha Spence: Part 11. Susannah’s last child was born late August or early September 1810, and Susannah died in childbirth. The loss of their mother introduced a nanny into the household, a young woman by the name of Mary Jane Bell (1795-1842). She was the daughter of Capt. Robert Bell of Guilford County, North Carolina (1736-1816) and his first wife–Mary Jane Boyd (1754-1795). Jane’s mother had died in childbirth while giving birth to her! On October 10, 1810, Elisha Spence and Jane Bell were married in Davidson County, Tennessee(1). The following year, their first child arrived followed by three additional children through 1826. The house became quite crowded and by 1820, the three older children–Samuel, Milly Catherine, and Daniel–relocated to Perry County, Tennessee to live with John David Spencer, one of their mother’s brothers(2). Their other brother, Levi James Spence, had returned to North Carolina and was living in Lenoir County in 1820(3). Samuel became enamored with Elizabeth Inman 1808-1872), daughter of Samuel Inman (1772-1830) and Mary Williams (1774-1830). They were married in Davidson County, Tennessee on May 10, 1824(4). Milly Catherine had already beaten them to the altar. On February 2, 1820, she married Lewis Jones (1795-1849) in Davidson County, Tennessee(5). Daniel divided his time between the Lewis Jones and Samuel Spence households and finally returned to Davidson County. He had his own conquest to make, and she lived in Williamson County! Road sign regarding early history of Leiper’s Fork, Williamson County, Tennessee. Sign lists the early pioneer families who settled there. Two populated places in Williamson County, Tennessee are important to this narrative. The first is Leiper’s Fork, and the second is Fernvale, which was mentioned earlier in the Levi James Spence article. Both places are close to each other, and are also close to Franklin. 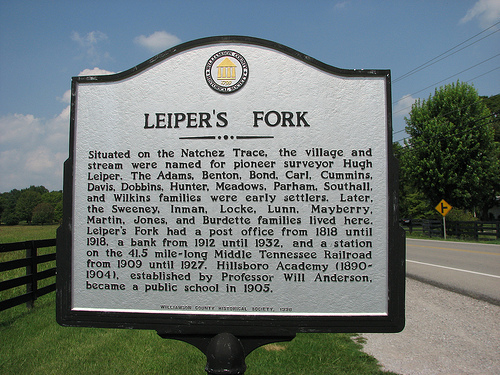 Leiper’s Fork is located along the Natchez Trace, which was an important travel route for Native Americans and early European-American settlers. The area was settled in the late 1700s by settlers from North Carolina and Virginia who had received land grants as payment for service in the American Revolution. Colonel Jesse Steed received a land grant of 2,504 acres (1,013 ha) that includes the site of the village. 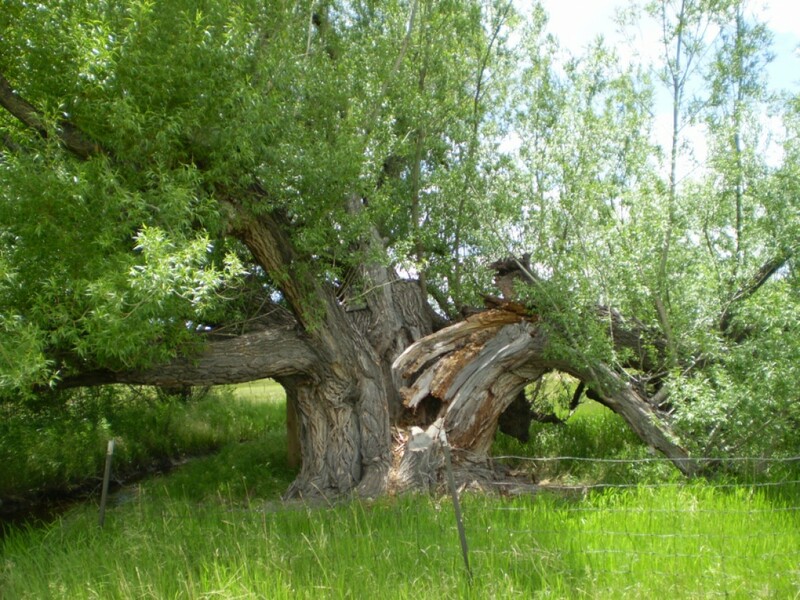 He sold the area to Jesse Benton, who established a homestead. His son, Thomas Hart Benton, who later was to become U.S. Senator from Missouri, moved the family there in 1801 after his father’s death. Natchez Trace travelers called the community around the Benton homestead Bentontown, but over time the area came to be called Hillsboro. In 1818, a post office was established in the community. Apparently the Hillsboro name was already in use for a community in Coffee County, so the post office was given the name of Leiper’s Fork for the stream that runs through the village. The namesake of Leiper’s Fork creek was one of two brothers: Hugh Leiper, who completed an early land survey in the area, or Captain James Leiper, who died in the Battle of the Bluffs at Fort Nashborough in 1781. Growth of the village was stimulated by traffic on the Natchez Trace. Largely as a result of its transportation access, Leiper’s Fork was historically the center of trade for western Williamson County and the center of religious and social activities in the area. The Leiper’s Fork post office operated until 1918(6). Situated on the Natchez Trace, the village and stream were named for pioneer surveyor Hugh Leiper. The Adams, Benton, Bond, Carl, Cummins, Davis, Dobbins, Hunter, Medows, Parham, Southall and Wilkens families were early settlers. Later, the Sweeney, Inman, Locke, Lunn, Mayberry, Martin, Jones and Burdette families lived here. Leipers Fork had a post office from 1818 until 1908, a bank from 1902 until 1932, and a station on the 41.5 mile long Middle Tennessee Railroad from 1909 until 1927. Hillsboro Academy (1890-1904), established by Professor Will Anderson, became a public school in 1905(7). Fernvale is a populated place where the Harpeth Furnace is located. There are also a number of cemeteries in the area: Inman Cemetery, which is two miles south of Fernvale, Bryant Cemetery, which is eighteen miles to the south southwest of Fernvale, Buchanan Cemetery, which is fifteen miles to the East of Fernvale, and Childress cemetery, which is nineteen miles to the east of Fernvale (located in Maury County). There are three Gray Cemeteries: one that is 25 miles to the east of Fernvale (located in Davidson County); one that is seven miles east southeast of Fernvale; and, one (Gray’s Bend) that is located twenty-one miles to the west southwest of Fernvale (located in Hickman County.) A Graham Cemetery is located twenty-two miles to the west of Fernvale in Hickman County. Other names of importance to this narrative include Adams, Alexander (5 cemeteries), Hood, Hughes, Hunter, Jones (there are 10 of those! ), Jordan, Martin (6 cemeteries), Moss (2 cemeteries), Russell (2 cemeteries), Smith (5 cemeteries), Taylor (3 cemeteries), Temple (2 cemeteries), Thornton (2 cemeteries), Wall (2 cemeteries), Williams (7 cemeteries), Wilson (4 cemeteries), and others(8). Mary Ann “Polly” Pewitt was born in 1810 in Williamson County, Tennessee to Joel “Jack” Pewitt (1779-1823) and Susannah “Sukey” Adams (1786-1848). Her father’s family came from Lunenburg County, Virginia, while her mother’s family came from Chatham County, North Carolina. Thomas Pewitt (1761/90-unknown). Thomas was born between 1761 and 1790 in Lunenburg, Virginia, and he died in Tennessee. The date of his death is unknown. He may have died young. Joel B. Pewitt (1814-1889). Joel was born in Virginia, and he died in Humphreys County, Tennessee. His first wife was Emily Radford (1820-1854). Their children were: (a) William Pettus Pewitt (1841-1926); (b) Columbus A. Pewitt (1844-1922); (c) Thaddeus F. Pewitt (b. 1847); (d) Mary Elizabeth Pewitt (1849-1881); (e) Martha V. Pewitt (b. 1851); (f) Susan A. Pewitt (b. 1854). His second wife was Mary Jane Coleman (1830-1895). Their children were: (a) Samuel W. Pewitt (b. 1863); (b) Robert Blackwell Pewitt (1865-1932); (c) Thomas H. Pewitt (b. 1867); (d) Lou Ada Pewitt (1872-1944). Mary Elizabeth Pewitt (1816-1900). Mary was born March 1816 in Lunenberg, Virginia, and she died after 1900 in Humphreys County, Tennessee. Her husband was John James Russell (b. abt 1818). I haven’t proven this as yet, but I believe John connects with the same Russell family mentioned in the Levi James Spence article. Their children were: (a) Sarah E. Russell (b. 1842); (b) Nancy W. Russell (b. 1845); (c) John Henry Russell (1848-1914); (d) Mary C. Russell (b. 1849); (e) Tabitha Frances Russell (1853-1925); (f) Franklin Pierce Russell (1870-1935). Joel “Jack” Pewitt, Jr. (1779-1823). Under discussion here. Adam Jackson Pewitt (1803-1854). Adam was born in Williamson County, Tennessee in 1803, and he died January 15, 1854 in Haywood County, Tennessee. His wife was Barbary Smith (1797-1860). Their children were: (a) Andrew J. Pewitt (1833-1910). Andrew relocated to Arkansas and died in Pope County; (b) Wyatt Elliott Pewitt (b. 1839); (c) an unknown child. Adam Jackson Pewitt (1803-1854). Adam was born in Williamson County, Tennessee in 1803, and he died in Haywood County, Tennessee on January 15, 1854. His wife was Barbary Smith (1797-1860) Their children were: (a) Andrew J. Pewitt (1833-1910); (b) Wyatt Elliott Pewitt (b. 1839); (c) an unknown child. Lewis Pewitt (1805-1850). Lewis was born in 1805 in Williamson County, and he died after 1850 in Laclede County, Missouri. His wife was Martha Patsy Cook (b. 1814). Their children were: (a) Catherine Pewett (b. 1833); (b) Martha Jane Pewitt (1835-1916); (c) Adam Pewitt (1837-1840); (d) Nancy Pewitt (1839-1915); (e) Barbary E. Pewitt (b. 1847); (f) Joseph Andes Pewitt (1847-1904); (g) James Pewitt (b. 1850); (h) Lewis E. Pewett (b. 1850); (I) Mary Pewitt (b. 1851); (j) William G. Pewitt (no additional information). Anna Mariah Mae Pewitt (1808-1885). She was born in Tennessee. I have no additional information about her. James Pewitt (1809-1854). James was born September 2, 1809 in Tennessee, and he died January 15, 1854 in Williamson County, Tennessee. His wife was Sarah Adams (1808-1866). They had a daughter: Sarah Jane Pewitt (1839-1890). John Andes Pewitt (1812-1890). John was born January 12, 1812 in Franklin, Williamson, Tennessee, and he died in 1890 in Sand Mountain, Bibb County, Alabama. His wife was Rebecca Elizabeth Givens (1817-1874). Their children were: (a) Mary Ann Polly Pewitt (1838-1889); (b) Adam Pewitt (1839-1910); (c) Thomas Pewitt (1842-1862); (d) Sarah Francis Pewitt (1843-1904); (e) George Martin Pewitt (1846-1910); (f) Judy A. Pewitt (1847-1923); (g) Jeremiah Samuel “Jerry” Pewitt (1851-1931); (h) James Martin Pewitt (1852-1933); (I) Nancy C. Pewitt (1858-1940). Nancy Pewitt (1788-1874). Nancy was born in Lunenberg, Virginia in 1788, and she died in Bastrop, Texas in 1874. Her husband was Daniel Gray (1787-1848). [Note: This is the same Gray family depicted in the Levi James Spence article. Daniel was a brother of Edna Gray, who married Hartwell Pewitt (see previous section). Daniel and Edna Gray were children of Deliverance Gray (1767-1840) and Palmer Tamer Koen Halstead (1760-1788). Deliverance was a son of Anthony Gray (1750-1803/4) and Polly Jordan 1754-1804), and a grandson of Nathaniel Dwight Gray (1744-1777) and Mary Jane Parker (1744-1799).] The children of Nancy Pewitt and Daniel Gray were: (a) John Wesley Gray (1812-1854); (b) Joshua Gray (1814-1836); (c) Ann Blackwell Gray (b. 1818); (d) Rebecca Gray (1822-1850); (e) Joseph Leonard Gray (1824-1863); (f) Sarah W. Gray (b. 1827); (g) Mary Jane Gray (1832-1855). In the early-to-mid 1990s, I traveled back and forth to Denver aboard a local bus. This was during the period of time prior to the availability of Echo Passes for the Express and Regional busses. I didn’t mind the locals. The trip took much longer than the Express, but it was during this period of time when I did a lot of reading. One book I remember in particular was called The Civil War in Missouri (1861-1865) or something similar to that title. After finding the surname Inman in the index, I checked out the book from the campus library and focused on the entry. According to the footnote, an incident took place outside Houston in Texas, County, Missouri concerning a bushwhacker by the name of John Inman. The Union Army wanted to capture him and eventually caught him near Houston. That night, John Inman escaped, and Union soldiers shot and killed him. Well, of course the name intrigued me. And during my next trip to the library, I discovered a number of Inmans resided in Texas and in Dent Counties, Missouri . I thought they may have been related to my third great grandmother, Elizabeth Inman (1808-1872), wife of Samuel Perry Spence (1800-1859). But if so, how? Only recently did I discover my answer! Winna Pewitt (b. 1804). Winna was born in 1804 in Williamson County, Tennessee. She died at an unknown date in Williamson County. Thomas Pewitt (1806-1847). Thomas was born in 1806 in Franklin, Williamson County, Tennessee, and he died in 1847 in Lawrence County, Arkansas. His wife was Tryphenia Thania Smith (1805-1832). Their children were: (a) John Smith Pewitt (1831-1864); (b) Elizabeth S. Pewitt (b. 1833); (c) Mary Ann Pewitt (b. 1834); (d) Nancy M. Pewett (b. 1838); (e) Tryphenia I Pewitt (b. 1840); (f) Thomas I. Pewitt (b. 1843); (g) Permilia Pewitt (1846-1938). James Pewitt (1809-1854). James was born in Tennessee September 2, 1809, and he died In Williamson County, Tennessee January 15, 1854. His wife was Sarah Adams (1808-1866). They had one known daughter: Sarah Jane Pewitt (1839-1890). Joseph Pewitt (1810-1840). He was discussed in the James Blackwell Pewitt section since he married James’ daughter, Barbara. Mary Ann “Polly” Pewitt (1810-1859). (If the birth dates are correct, she and her brother, Joseph, were twins.) Wife of Daniel Spence (1806-1857). They will be discussed in Part 10. Nancy M. Pewitt (1814-1869). Nancy was born in 1814 in Williamson County, Tennessee, and she died about 1869 in Dent County, Missouri. Her husband was Henry C. Duke (1812-1870). Their children were: (a) Malachi Duke (b. 1833); (b) Emily Duke (b. 1837); (c) Robert Duke (b. 1839); (d) Susannah Duke (b. 1842); (e) William Duke (b. 1844); (f) Lavinia Duke (b. 1848). Malachi Pewitt (1816-1882). Malachi was born in Williamson County, Tennessee July 12, 1816, and he died October 25, 1882 in Dry Fork, Dent County, Missouri. His wife was Mary “Polly” Elizabeth Inman (1820-1854). She was a daughter of Ezekiel Inman (1796-1862) and Lillis Hester Edgar (1798-1873), a granddaughter of Lazarus Inman (1765-1850) and Susannah Stovall (1765-1850), a great granddaughter of Meshach Inman (1749-1771), and a sister of Annis (Annas) Inman (1832-1855), who married Laban Pewitt (1821-1869). The children of Malachi Inman and Mary “Polly” Elizabeth Inman were: (a) William Washington Pewitt (1837-1919); (b) Sousanah Malinda Pewitt (1839-1871); (c) Nancy Jane Pewitt (1842-1935); (d) Joel Pewitt (b. 1845). Malachi’s second wife was Juretta Catherine Medlock (1833-1900). Their children were: (a) David Pewitt, born 1856; (b) Mary Albertine “Tina” Pewitt (1866-1941); (c) James H. Pewitt (1868-1928); (d) Lillian Amberzine Pewitt (1870-1930); (e) John S. Pewitt (b. 1873); (f) Silas Luther Pewitt (1875-1929); (g) Josaphine I. Pewitt (1879-1935); (h) Laborn (Laban) Pewitt–nothing else is known; (I) Martha Pewitt–nothing else is known. Laban Pewitt (1821-1869). Laban was born about 1821 in Williamson County, Tennessee, and he died in September 1869 in Dent County, Missouri. His first wife was Annis (Annas) Inman (1832-1855)–mentioned in the previous entry. They had one son: Wiley Pewitt, born 1849. Laban’s second wife was Sarah Jane Wolford (1832-1864). Wiley W. Pewitt (1822-1864). Wiley was born in 1822 in Franklin, Williamson County, Tennessee, and he died November 1864. He is buried in the Mount Hermon Vet Memorial Cemetery, Dent County, Missouri. His wife was Mary Elizabeth Birchlew (1826-1887). Their children were: (a) Laban Pewitt (1844-1862)–he died during the Civil War while serving in the Confederate Army; (b) Susannah “Susan” E. Pewitt (1847-1895); (c) Thomas J. Pewitt, born 1849; (d) Virginia A. Pewitt (1851-1924); (e) Lorenzo Dow Pewitt (1853-1891); (f) Amberzine Tennessee “Ammie” Pewitt (1855-1939); (g) James B. Pewitt (1857-1944); (h) Joel Price Pewitt (1862-1920); (I) William Wiley “Will” Pewitt (1864-1892). “When I first started researching, I thought Grogan was going to be my easiest family to trace but I found it more difficult than I thought. I have sent for a copy of my grandfather’s death certificate, and I am hoping it will have his mother’s first name on it. That will help with the Inman side and hopefully we will be able to make a connection. I also heard from someone in Texas County, Missouri who told me where to write for information on the Grogans there. I hope I can find T. J. (Jeff) Grogan”s parents. I did find a Thomas Jefferson Grogan at the family History Center at the LDS Church, but I’m not sure it is the right one or if his name is Thomas Jefferson. “I don’t have any Spence families, but in reading your query, I noticed your maiden name and thought since you were a genealogist as well as an Inman, I might hit it lucky. Please forgive the length of this query. My great-grandfather, Cleo Patrick ‘Tobe” Aaron (b. 1863 AL), married my great-grandmother, Margaret Wood Tomlinson in 1888 in Dunklin County, Missouri. The Aaron family were making their way to Texas and stopped in Dunklin county long enough “to make a crop” and–as it turned out–long enough for Tobe to meet and marry Margaret. The marriage didn’t last. Shortly after my grandmother was born (December 1889), the Aarons were divorced. Tobe moved on to northeastern Texas to rejoin his family. In October 1896 in Fannin County, Texas he married Lula Morris. He died there in 1959. Except for his name, I knew nothing about Cleo Patrick “Tobe” Aaron until I started searching two years ago. I found him in the Mormon Ancestral File. Three marriages were listed for him–the two I have mentioned AND a marriage to someone named D. INMAN. There is absolutely no other information. I located Tobe’s present-day family and asked them. Apparently Tobe had kept his marriages to my great-grandmother and to this D. Inman a secret for many years. And because his wife was so upset when she found out, his other marriages were never discussed. I will explain the John Inman–bushwhacker question since it was an issue that I originally raised. Last fall, I was doing a considerable amount of research concerning the border wars between Missouri and Kansas during the Civil War. I ran across an account (source misplaced at the moment) describing the execution of a “notorious” bushwhacker named John Inman by Union forces in Texas County, Missouri. As I recall, John Inman and another bushwhacker were first captured by the Union Army and were being held prisoner. Inman and the other bushwhacker attempted to escape and were killed while running. Since discovering that information, I have been trying to discover the identity of John Inman and his possible connection to the Tennessee Inman families, from whom I descend. Texas County, Missouri is some distance from Jasper County, but location does not decide relationship as far as families are concerned. A trip to the local library disclosed a John Inman living in Texas County on the 1850 Census. However, I don’t know whether this was the same John Inman–alleged bushwhacker. So I placed a query on the Internet, and the response was really surprising–not concerning John Inman, but another relative. I heard from a man who had done a considerable amount of research concerning Missouri bushwhackers who rode with Quantrill, Bloody Bill Anderson, and some of the others. He said that he would check his research and get back in touch with me. A few days later, he sent me a complete listing of all the known bushwhackers in Missouri, including the leader under whom they served. As I recall, his comment went something like this: “Couldn’t find your John Inman, but I’m sure you’ll find another name you mentioned (chuckle): ‘The other name: James Bunch–my ggg uncle who married Milly Catherine Spence, my ggg aunt, in Jasper County, Missouri.’ Allegedly, he rode with Quantrill!” (I knew that my James Bunch was head of a Confederate Home Guard Unit in Jasper County, and I remember my grandfather describing him as “a Confederate guerilla fighter,” but until I saw this list, I didn’t know how extensively he was involved. No doubt, that is the reason the Bunch family and my ggg grandmother, Elizabeth Inman Spence, fled Missouri after the Civil War and went down into Texas). I am still in a quandary about John Inman, however. As I recall, the source suggested that many men were falsely accused of bushwhacking as an excuse for killing them simply because their sympathies remained with the South. This may have been true of John Inman. Hopefully, someone will have the answer to this question(9). The Inman Innings article was written in 1996. Since then I learned Quantrill’s James Bunch lived in Northern Missouri and was not the James Bunch who headed the Confederate Home Guard Unit in Jasper County, Missouri. And I believe I have identified John Inman the bushwhacker’s family. He did not come from the Dent County Inmans who intermarried with the Pewitts. He was part of the Texas County Inmans who descended from the South Carolina Inmans. Their Inman line was in Charleston at an early date. They moved up through the Carolina back country and settled in Tennessee. My southern Inman line and their cousins in Dent County originally settled in Maryland and moved to North Carolina. From there, they moved to Williamson County, Tennessee. I do not believe the Dent County Inmans or the Houston County Inmans were directly related. Mary Ann “Polly” Pewitt and Daniel Spence settled in Jasper County, Missouri with Spence and Jones relatives. Some of Polly’s siblings intermarried with Elizabeth Inman Spence’s cousins and settled in Dent County, Missouri. The Dent County people supported the South during the Civil War. Daniel Spence and Mary Ann “Polly” Pewitt’s family supported the North. There does not appear to be any interaction between the two groups. As will be shown in the next article (Elisha Spence, Part 10), some of Daniel and Polly’s children fled to Kansas during the Civil War, and several of them stayed there. A mystery resolved for the moment concerning the identity of a Missouri Inman bushwhacker! Now for the Tennessee Inman scoundrel! Hezekiah W. Inman (a/k/a Hezekiah Haney) (1770-1847). Hezekiah W. Inman was a brother of my fourth great grandfather, Samuel Inman (1772-1830)–therefore, my fifth great uncle, and an uncle of my third great grandmother, Elizabeth Inman Spence (1808-1872)–wife of Samuel Perry Spence (1800-1859). I didn’t mention his extra-curricular activities in The Burke County, North Carolina Inman Family, but I am doing so here since they tie in indirectly with the Spences and the Pewitts. In 1805, Hezekiah left his family and moved to Anson, North Carolina, where he lived under the name Hezekiah Haney. He was living with Nancy Devine, who used the name Christina/Christiana Spears(10). 3 (sic) C Inman }v. } subp } to answerH. Inman___________ 9th October 1814 ___________ Came to hand10th October 1814 Not found /s/ Wm Hu___________(11). In 1824, Hezekiah married Eliza A. Branch (1803-1897) in Williamson County, Tennessee, and he had two additional children by her. His first wife wasn’t about to take him back, and his situation with Nancy Devine undoubtedly ended when he couldn’t get his way about Christiana’s property. He lived in Wayne County, Tennessee in 1830(12) and in 1836(13) and by 1840, he and his family relocated to Marshall, Mississippi(14). Hezekiah died in Marshall County, Mississippi before September 1847. (7) Inscription on the Leiper’s Fork Historical Road Sign, Williamson County, Tennessee. (9) Barbara Inman Beall, Editor. “A Grogan-Inman Problem”, Inman Innings, Vol. 2, No. 2. Spring 1996.